And that also means that I get to sew some new pillow covers for our outdoor pillows! Yay!!! I love adding a new look to old things. So...I've got my pillow (on sale from target last year...waited months and months and they finally got down below $3, so I bought 4), and Joanns was having a sale on their 'semi' outdoor fabric. So, I jumped and bought a yard of each. From my experience, one yard will make two pillow covers. Step 5: Once you get the measurements right, pin and stitch around the openings. Step 6: Turn inside out and put the pillow inside. And voila! 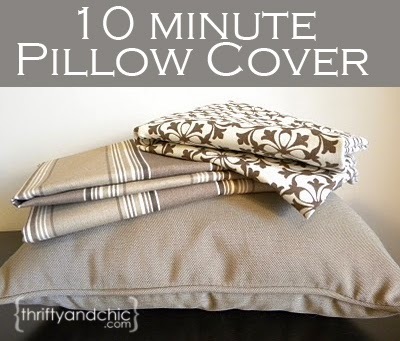 A sewwwwww easy 10 minute pillow cover. I am so going to be enjoying this patio today...tomorrow...and hopefully for the next few months unless this unpredictable weather has another snow storm planned for us....I think then I just might cry. Once you get a hang of making these, you can cut the time in half. they are that easy to make :) Or if you have already made one, you can use that size as the template for the next ones so you don't have to keep on putting the pillow on top of the fabric to make sure of the right measurements. I love these! And you made it look so easy. i get a little intimidated when it comes to sewing, but you've inspired me! Adorable pillow covers! Where did you get the bench seat that they are on? great tute on the pillow cover! I need to make some, but I hate to sew. I would rather be using the table saw. Thanks for visiting and taking the time to comment on my repurposed headboard. I have been thinking of sewing pillow covers for ages and this one is the easiest tutorial I have seen. That is easy--I like easy :)--thanks for sharing! I love that you can pull the pillows out to wash or recover. Great tutorial! thanks! Your blog is full of wonderful ideas and tutorials that are easy to follow! I enjoyed browsing through your blog and looking at your neat projects. I can't wait to make some outdoor pillow covers using your tutorial. Your headboard ideas are fabulous! I'm happy to be a new follower!!! I just used this tutorial to sew a new cover for one of my pillows! It was really easy and looks great! Thanks! BTW, love your blog! I've been following for a long time! Hey, I was a little apprehensive to start sewing but you have made it so simple and clear with the pictures! Great Job! Thank you for the tutorial! I just made two covers for my pillow. It was my first sewing project. Ever. It went pretty well, and your tutorial made it easy! you made it easier than easy. great tutorial and great choice of fabrics. Thank you! This is the first time I've ever tried making anything without a pattern and it was SO easy! You have inspired me! PInning it now and I'll be attempting this soon! I have minor pillow obsession, but if I could make my own covers...Who knows where I could go with it? Wow, you've made sewing covers so easy (pun intended)! I wish I'd have had this 12 weeks ago when I spent hours measuring, basting and sewing. Thank you!! I dug out my mom's antiquated sewing machine and if I can get it to work there all of my old pillows better run!! Love this easy pillow cover. Thought I would have to close it with zipper or velcro but this works just fine. Since I used a solid satin fabric, I will be adding the tucks to give it more of a textured look. Thank you so much! This is a super easy way to make pillow covers. I have two 20" pillows that need new covers thanks to my dog. So today I did a sample cover with some left over fabric. I was very pleased with the results, but I think I will use velcro for the closure. I wanted to make sure the cover was snug and was not too sure how to allow for the opening without it being too big. I have been looking for covers on line, even though the choices are endless, I still couldn't find what I wanted. This way you can choose any fabric you want. Thanks for all your great ideas, I will refer to this site for future projects.